There are some major differences between buying and building a luxury home. The fruits of your labor can be exceptional if you choose to have your dream home built, but this isn’t a task that anyone should undertake without doing ample amounts of research, planning, and weighing of the options between building and buying. We field many questions from buyers interested in our beautiful luxury Dove Mountain homes every day, and people often ask what factors they should consider when building a luxury home on raw land. As such, we wanted to take this opportunity to share with you some of the information we provide to future neighbors of our luxury Dove Mountain homes. Like anything else in life, there are pros and cons to building a new home on raw land as well as purchasing an existing house. A Fresh Canvas. When you purchase a home on an existing property, you’re also inheriting the landscape that already existed. If the lawn wasn’t well-kept and properly manicured, your new home may also come accessorized with weeds and mature plants, shrubs, and trees that can add substantial costs to procure properly. Building on raw land gives you the benefit of starting from scratch and working with a blank canvas where you can choose how to adorn every inch of your property as you see fit. Privacy. Well-established communities also tend to have established populations. In other words, when you buy an existing home, a portion of your purchase includes the surrounding environment. The more populous the neighborhood you choose, the less privacy you will have. When you choose to build on raw land, however, you have the ability to build privacy into your purchase. 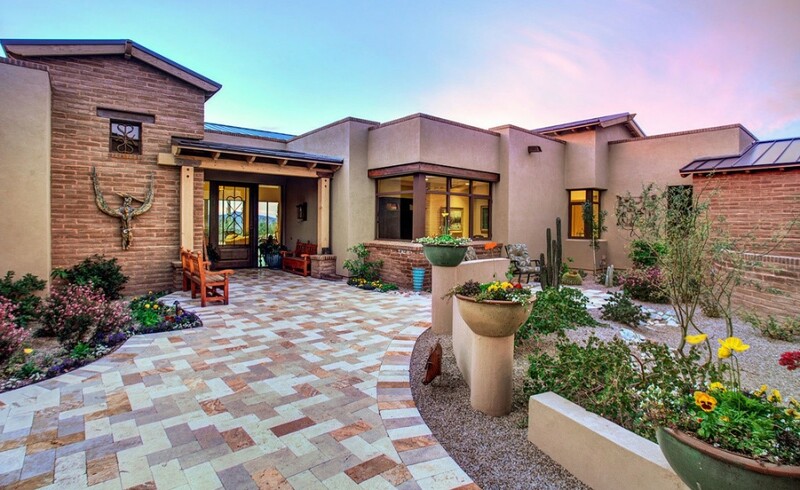 Our luxury Dove Mountain homes are built on expansive properties that create ample space between neighbors. That said, we also offer an exceptional variety of existing custom homes that will never be endanger of overcrowding as a result of our carefully planned and well-plotted property layouts. Our community provides buyers a rare and unique ability to make choices from the ground up. Cost. Of course, cost is certainly a consideration that you need to take into account. Often times, the cost of building on raw land can cost substantially more up front than that of an existing home. Due Diligence, or research costs, which includes hiring a real estate agent and paying for his or her travels while he or she visits the property and evaluates the land. Conversion Costs, or the amount of money necessary to make the raw land inhabitable with items such as a proper sewage system and water lines. Carrying Costs, or those costs associated with fees that will exist in the future. This is where loan interest and property taxes would be classified. Bear in mind that cost should not necessarily be seen as a prohibitive element. The benefits and future value of your home, which can result from the investment of raw land, could easily outweigh the initial expenditure. At The Residences, we like options. You can build one of our luxury Dove Mountain homes on an available homesite, or you can choose from the existing custom home floor plans and move into your home quickly (and typically for less money). Our luxury Dove Mountain homes offer stunning views from every angle with ample space upon which you can build your very own dream home. Take a virtual tour of the available homesites, and contact us when you are ready to picture your perfect home in person.